Former Arsenal star John Hartson has revealed that Kieran Tierney is being targeted by Manchester United, who see him as their main transfer target. Jose Mourinho has been on the lookout for a player who can play out wide, and had initially been keeping tabs on a few wingers – most notably Inter Milan’s Ivan Perisic and Real Madrid’s Gareth Bale. However, moves failed to materialize for either of the two, and United have since changed plans, opting to try and strengthen another area of their side that is relatively weak at the moment. Left-back has been a position of many struggles for the Reds in the last few years, with Luke Shaw’s inconsistent form and Ashley Young’s injury woes leaving them short in the area. Daley Blind, Marcos Rojo, Phil Jones, Matteo Darmian, Timothy Fosu-Mensah and Eric Bailly have all deputized in the position to paper over the cracks, but Mourinho is now looking for a permanent fit – a player who is naturally accustomed to the position. Danny Rose has been linked with a move to Old Trafford this summer, after his recent criticism of the way his club goes about their financial business. 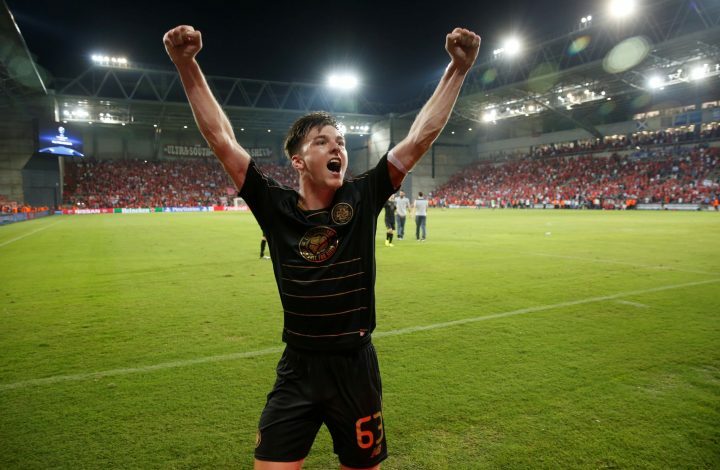 However, according to former Celtic and Arsenal striker Hartson, Mourinho has set his eyes on another young left-back – Celtic’s Kieran Tierney. “Give him another year, 18 months at this level until he becomes more of a man, more established, more mature physically, then in 12-18 months’ time, there is no doubt Kieran Tierney will go on and play for one of the top three or four clubs in England, and become one of the best left-backs in Europe.